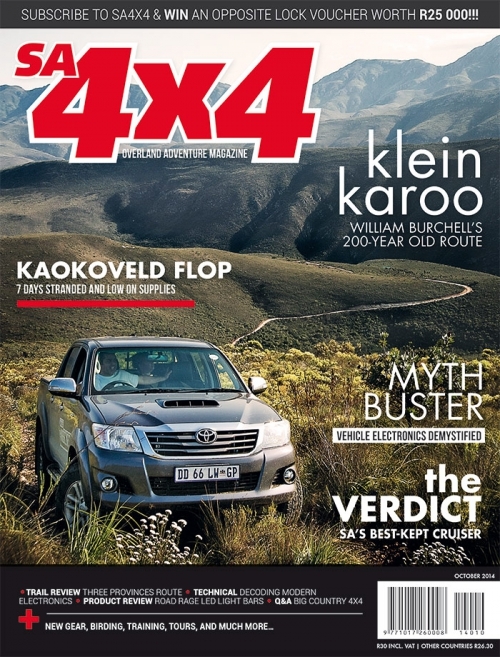 On 14 December ‘13, Tracey (my wife), Rick (my step-boet), Todd (Captain America) and I, packed our trusted Land Cruiser GX80 Series and set out for what was sure to be one of our best overlanding holidays yet. 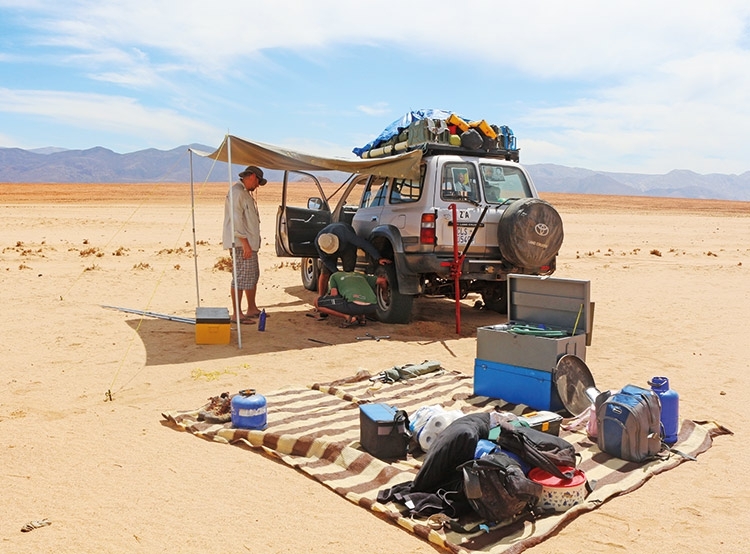 Having overlanded through most of the continent, we had a vast amount of 4×4 experience between us and prepared for this trip like any other − with loads of supplies. 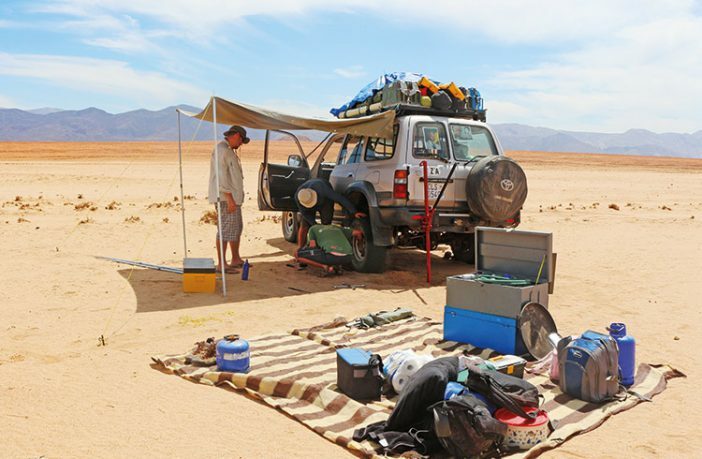 Our journey took us first to the Trans Kalahari highway, heading towards Etosha Pans, where we were fortunate enough to see lions and a black rhino. Our next stop was Hobatere, a rustic and magnificent campsite. This magic part of our journey continued through Ruacanna, Hippo Pools, Kunene River Lodge, white-riverrafting, and then onto Epupa Falls. Until then, our LC80 had served us well; the only problem had been that our fridge seemed to work intermittently, and our beers were not ice-cold. It was just after completing the infamous Van Zyl’s Pass that our first signs of trouble appeared. We noticed that brake fluid was leaking from the back left wheel. Although the brake pressure seemed fine, we continued, carefully, to the community camp. The community camps in the Marienfluss Valley are run by the Himba people. This is a fantastic way of involving the community in tourism, and campers can make use of private bathrooms and showers run by solar power. We’d decided that we would spend Christmas there and take two relaxing days overlooking the river; although I started my time “off” by doing some running repairs: disconnecting the brake line at the split above the rear diff, and inserting an old end-piece of sealed brake line. Now we were up and running on three brakes and the leak problem was solved… right? The wind was so strong on both days that we eventually decided to make use of our trusty Cruiser as a windbreaker. When we’d had enough, we left (early in the morning) to make good time to reach Orupembe and enter the riverbed heading towards Puros − the part of our trip we’d been waiting for. Not many people take this route through the valley; we looked forward to sighting desert lions and elephants and being in the middle of nowhere. Our next sign of trouble was a faint grinding sound that seemed to be coming from the passengerside rear wheel, and which very quickly got louder. We stopped immediately − from the white smoke it was obvious the drum was overheating. We decided that brake fluid must have covered the pads and internal mechanics in the drum, and the dust inside was causing the pads to bind. The drum had to come off; I thought that if we removed all the internal mechanics and pads, we could eliminate the binding problem and be on our way. Obviously not an ideal situation, but we still believed that our bearing was intact, and that we could either make it out of the sandy valley and onto Marble Camp 30 km ahead of us, or, turn back to the community camp. What we could not do, was stay there.We pushed on, having faith that with the wheel now rolling freely, it would keep doing so long enough to get us out of the Marienfluss if we kept to a very slow pace. But, no such luck; about 15 km later the tainted wheel began making a very loud grinding noise.